Libyan Conflict Rages After U.S. Shuts Embassy : The Two-Way Fighting in the country's east has killed at least 38 people since the U.S. on Saturday temporarily closed its embassy in the capital, citing security concerns. 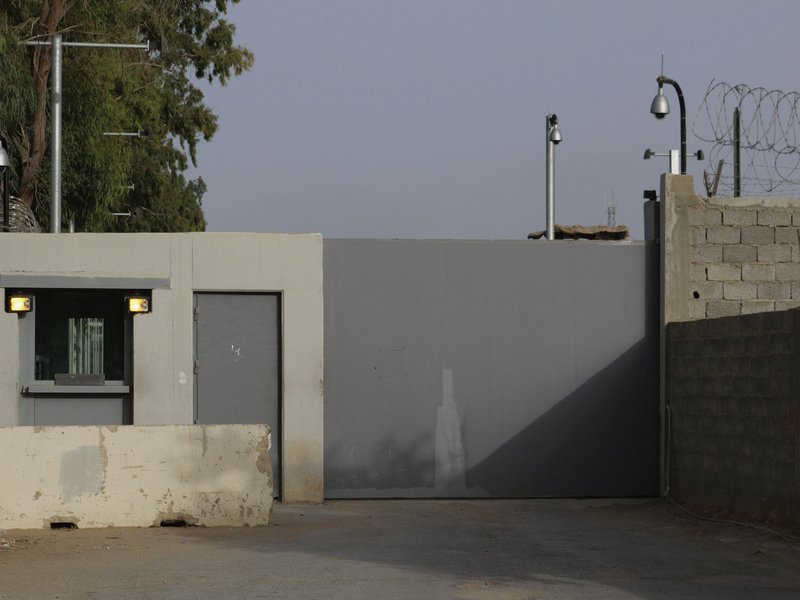 The entrance of the compounds of the U.S. embassy is pictured in Tripoli on Saturday. Fighting continues to rage after the U.S. evacuated the diplomatic facility. Clashes between renegade Libyan army troops and Islamist-led militias have killed at least 38 people, including civilians, in and around the eastern city of Benghazi. The fighting comes a day after the U.S. temporarily shuttered its embassy in Tripoli and evacuated diplomatic personnel to neighboring Tunisia, citing security concerns. The Associated Press quotes an unnamed security official as saying the fighting has been between forces loyal to Gen. Khalifa Hifter and Islamist militias that started Saturday and has continued through early Sunday morning. According to AP: "The official said commando forces regained control of four military camps captured by Islamist militias in the past few days. Health officials say rockets fired during the fighting hit civilian homes, causing casualties and wounding dozens of people." Separately, 23 Egyptians working in the capital, Tripoli, were killed when a rocket hit their home on Saturday, Egypt's state news agency reports. NPR's Leila Fadel says that "[rival] militias in the capital continue to fight for control of the international airport." Reuters notes: "In the last two weeks, Libya has descended into its deadliest violence since the 2011 war that ousted Muammar Gaddafi." Warplanes hit militant positions belonging to Ansar al-Sharia and another militant group in Benghazi, the news agency says.